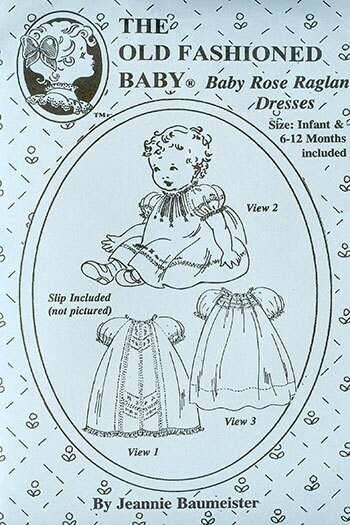 Baby Rose Raglan Dresses is the sweetest baby dress pattern ever. View 1 is an elegant little dress with its lovely lace embellishment and is surprisingly easy to make. Lace insertion graces the front with embroidered accents. Entredeux and lace finish the neck and sleeves. The hem features lace insertion edged with gathered lace. This dress was inspired by an Acadian Christening Dress. View 2 is slightly gathered around the neck and features tucks and lace insertion at the yoke bordered with embroidery. The hem features lace insertion with embroidered accents as do the sleeves. Entredeux is used to attach the sleeves. View 3 is simple in design and sweet as can be. Featherstitching and Seed Stitch embellish the front yoke and Featherstitching is worked along the shoulder seams. The neck is gently gathered and an embroidered Running Stitch accents the hem. The neck is gently gathered and an embroidered Running Stitch accents the hem. 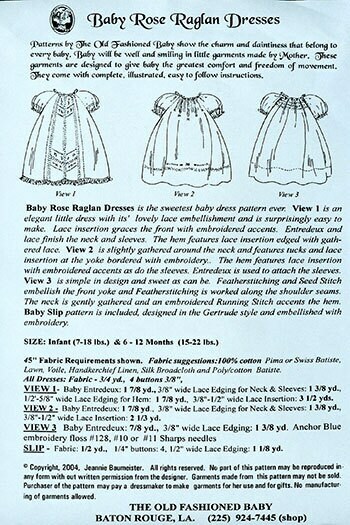 Baby slip pattern is included, designed in the Gertrude style and embellished with embroidery. This is a Very Special Dress for Baby and the Raglan style is so comfortable and easy to fit. Great buy! Happy to have this sweet pattern. I buy a lot from this seller. Always happy w purchase! Quality Product with fast shipping! Thanks.